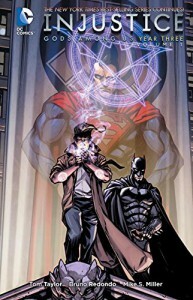 After the massive assault plan failed, Batman is forced to ally himself with the forces of magic to try and stop Superman. Skeptical rational Batman seems like the kind of person who would be very uncomfortable around magic users, but desperate times. I would prefer to see Batman trying to Scooby Doo a character like John Constantine and expose him as a fraud rather than accept magic at face value, but Batman does live in a world where magic gets thrown around a lot. I was a tad disappointed in how Captain Marvel was portrayed in this story. One of Caps powers is supposed to be wisdom, but often writers forget the wisdom part and fall back on portraying him as a child in a man's body. Cap naively continues to trust Superman even though he has gone totally dark side. And yes I know DC calls the character Shazam now, but he will always be Captain Marvel to me.